Hush are one of the UK's specialist manufacturer's for acoustic and soundproof materials - take a look at our products and simply call us if you need any further help. Are you an Architects studio or design agency looking to improve your knowledge on acoustics and building regulations? Hush provide a unique CPD presentation to companies in the UK. Our manufacturing support is recognised throughout the Architectural and Building industry with 1:1 specification advice and installation guidance. Browse and download the HUSH Acoustics datasheets. Request a personal consultation with our acoustic experts. Hush Acoustics specialises in a soundproofing & sound control products for domestic and commercial industries. Hush has been involved in the design and manufacture of soundproofing products and systems for over 25 years, in fact, we are one of the longest established acoustic product specialists in the United Kingdom. The business was launched in Scotland which is considered the home of sound insulation and in 1998 was relocated to North West England from where the Company has established a nationwide distribution network. 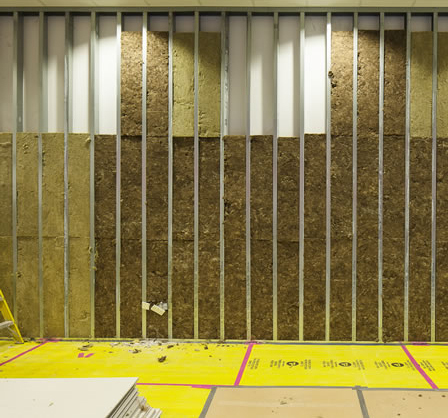 We provide acoustic solutions for separating floors, ceilings and walls in both new build and refurbishment projects whether it be multi-occupancy, single dwelling, school or commercial premises. All products and systems exceed the requirements of UK Building Regulations in Scotland, Northern Ireland, England and Wales, including Robust Details, BB93 and Code for Sustainable Homes parameters. As an Eco Friendly Company our products are responsibly sourced from sustainable and recycled raw materials with absolute minimum usage of petro-chemical based foam products. Whatever your Acoustic Flooring, Sound Control, Sound Reduction or Sound Insulation needs, Hush can provide you with the soundproof flooring and insulation products you need.